(Nanowerk News) 'Nano–machines' (around one billionth of a metre in size) of the future will need tiny devices to reduce friction and make movement possible. The C60 molecule, also known as fullerene or buckyball, seemed to many an excellent candidate for nano-bearings. Unfortunately, the results so far have been conflicting, calling for further studies, like the one carried out by a theoretical team involving SISSA, ICTP, CNR and EMPA. Through a series of computer simulations the scientists uncovered the reason for the experimental discrepancies and shed light on the true potential of this material ("Does rotational melting make molecular crystal surfaces more slippery?"). About 3500 years ago, man invented the wheel to make life easier. Then, thanks to Leonardo Da Vinci’s genius, the wheel was made smaller to obtain ball bearings. And today? “Today we are trying to get even smaller: scientists are thinking about nano-bearings”, comments Andrea Vanossi, of the CNR – Democritos and the International School for Advanced Studies (SISSA) of Trieste, among the authors of a study that has just been published in Nanoscale. “In the future we’ll have many nano-machines capable of carrying out the most diverse tasks, for example transporting medicines inside the human body. In order to save energy, many of these vehicles will have to able to move efficiently, using as little energy as possible, and “nano”-sized ball bearings may help achieve this goal”. “Scientists thought they could use C60, a hollow carbon nanosphere, measuring one nanometre in diameter”, explains Erio Tosatti, SISSA professor and another author of the study”, but there’s a problem: the experimental results are at complete variance with each other”. C60 has a temperature (260° Kelvin) at which the molecules suddenly become free to rotate, which hopefully has a role in friction. The two most important experiments carried out to date, however, have yielded conflicting results: above this temperature, when the material was made to slide over a substrate, in one case there was no significant decrease in friction, whereas in the other the decrease was dramatic, a good 100%. “What’s going on? If we assume that the measurements are correct and the experiments performed correctly (and we have no reason to believe otherwise) how do we explain this difference?”, wonders Vanossi. “For this reason, we decided to verify”. The team (a collaboration between SISSA, the International Centre for Theoretical Physics “Abdus Salam” ICTP of Trieste, the Italian National Research Council CNR, and the Swiss Federal Laboratories for Materials Science and Technology) conducted a theoretical, simulation-based study. “We simulated the tiny tip of an electron microscope bearing a C60 flake, which was dragged over a surface also made of C60”, explains Vanossi. “We discovered that when the flake was attached in such a way that it couldn’t rotate the friction did not decrease, even if we raised the temperature to above 260° K. It’s as if the bearings making up the flake interlocked with the substrate, with no nano-bearing effect. However, when the flake was free to rotate there was a dramatic drop in friction and the flake could slide over the surface far more smoothly”. But here the drop in friction is not due to the ball bearing effect, but to the change in contact geometry. The two states therefore reproduce the results of the two experiments. “Our data faithfully reflect the empirical observations”, concludes Tosatti. 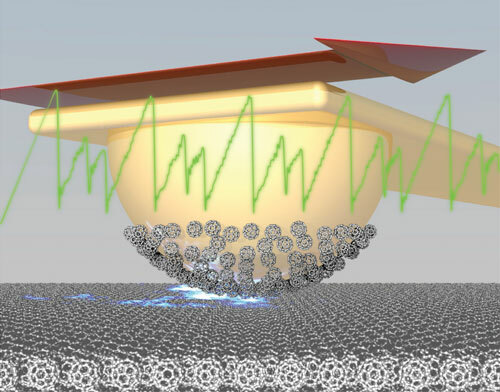 “This of course does not bode well for the future use of fullerite to reduce friction at the nanoscale, in that the nanobearing function is not confirmed, but it does finally shed light on the physics of this problem”.